Ship to shore gantry crane is a type of large gantry crane found in port and quayside to load, unload and transport intermodal containers from vessels. Therefore, it is also known as container handling gantry crane or sts gantry crane for short. 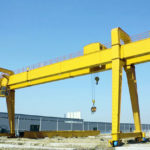 It generally travels along two rails that are spaced according to the size of sts crane. The ship to shore container gantry crane is equipped with a specialized spreader to handle the stack of containers instead of a hook. It can be extensively applied in medium-sized to large container terminals to help increase productivity and decrease dwell times. The ship to shore gantry crane is distinct from other forms of gantry cranes in that it has multi-story structure. The design of ship to shore gantry crane will be determined by the size of container ships and local environments. It can also be custom designed and built for your requirements. The ship to shore container gantry cranes adopt modular design and is available in 8-wheel, 10-wheel and 12-wheel configurations. The load capacity, span and outreach is designed according to your specific uses. Supporting framework: it is a basic structure of sts gantry crane that can travel across the length of port or quay. It consists of vertical frame and braces and also supports the crane boom, cabin and containers. Crane boom: it is a horizontal beam that outreaches the berth. It spans the width from landside rail wheels to the edge of berth. Spreader: it is specifically used for handling containers. The spreader can move vertically to raise and lower loads as well as travel horizontally along the boom. During movement, the spreader will be located on top of a container and lock it safely in place by way of using a twist lock mechanism that will lock onto the corner castings of container. Travelling system: it incorporates the uses of several rail wheels, typically 10 rail wheel configuration. The wheels are mounted to the bottom of supporting frame. Operator’s cabin: the enclosed cabin with glass paneled flooring provides an easy and convenient way for operator to view the containers being moved. It will significantly increase productivity of port operation and minimize the time to load and unload container ships. It bears a large capacity, normally up to 80 ton. 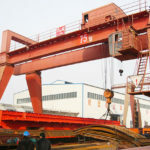 The gantry crane offers a safe lifting operation. In the event of hurricanes, tie down assemblies will be used to prevent longitudinal movement along rails as well as overturn of the crane. It has long working life and reduced downtime. It provides precise positioning and stable performance. It offers more comfort during lifting operation. The ship to shore gantry crane for quayside is typically operated by a driver sitting in the cabin that is suspended from the trolley. During operation, the trolley will run along rails mounted on the top or side of the boom to lift containers onto and off the ship. The operator’s cabin is an enclosed unit with glass paneled flooring, making it convenient for operator to view the cargo being lifted. Another type falls in remotely-controlled sts gantry crane that is operated from a remote control station. At present, the cabin control is a common way to implement lifting operation. 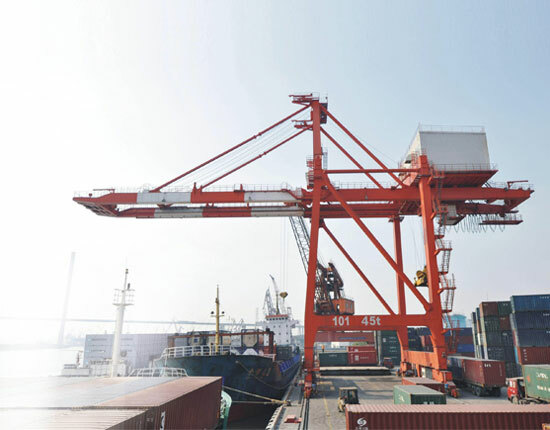 The operator of ship to shore gantry crane should receive a professional training on the knowledge and expertise of the crane and be deemed competent to operate the gantry crane. As many gantry crane accidents result from human errors, the operator should be in strict compliance with operation regulations and rules to ensure a safe lifting operation. The size and specification of ship to shore gantry crane is highly determined by the load being lifted, local environment and the size of container vessels. It can be classified into multiple styles based on the lifting capacity and size of ship. Panamax gantry crane: it has the capability to load, unload and transport containers from panamax class containers ships of up to 13 containers wide. The outreach is up to 38m. Post-panamax container gantry crane: it is able to lift and transfer containers from container vessels that are too large to pass through the Panama Canal. It can have an outreach of 16 container rows. Super post panamax gantry crane: it is the largest container gantry crane for vessels of more than 20 containers wide. The outreach of this crane is up to 53m. To learn more about ship to shore gantry crane dimensions and specifications, contact the sales team now. 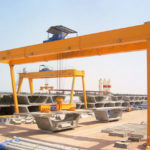 The quayside gantry crane is constantly developed and improved to meet a higher requirement for lifting as well as the development of large-scale container vessels. 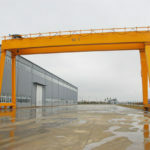 Compared with other forms of gantry crane, it has larger size and more complex construction, thus it will cost much more than a typical travelling gantry crane. 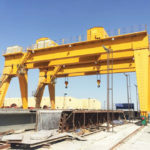 If you would like to know ship to shore gantry crane prices, tell us your specific requirements, such as rated load capacity, required outreach, span, lifting height above and below rail, and lifting speed. Other valuable information such as local environment and safety precautions is also necessary to design the most suitable solution. We will offer a powerful and affordable lifting solution for dockside operation. Email us now to get a discount. 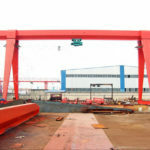 When looking for a ship to shore gantry crane, just go straight to the manufacturer who will offer a quality product and factory price. 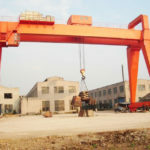 We are one of leading ship to shore gantry crane manufacturers and suppliers in China, and provide multiple types of gantry cranes and services for clients. In Ellsen, you will enjoy a profound service encompassing the equipment design, manufacturing, commissioning as well as after sales service that is offered by our highly skilled workers. 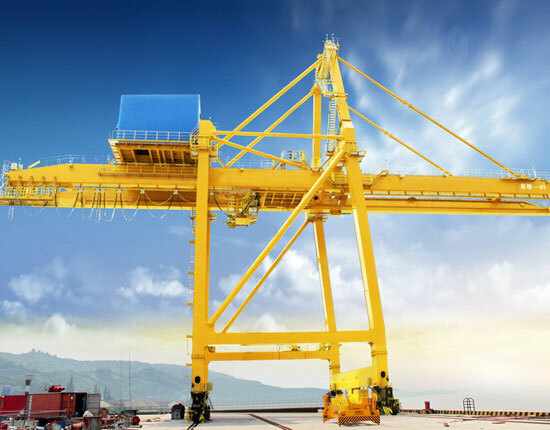 To know more about ship to shore gantry crane and our company, contact us today! 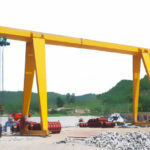 As a professional gantry crane manufacturer and supplier in China, Ellsen provides multiple types of gantry cranes to suit a wide range of applications, such as single girder, double girder, truss type, cantilever type and semi gantry crane. We promise to provide quality products and best services for clients. Contact us online now! Please feel free to send your inquiry to us!